Maine sees 24 trillion gallons of rain annually – and scientists think Maine is likely to get even rainier due to climate change. More rain can lead to increased water runoff, potentially resulting in algae blooms as fertilizer gets washed from agricultural areas into the water table, requiring careful management. On top of its incredible water assets, 90% of Maine is covered in forest – a higher percentage than any other state. The stunning breadth of Maine’s ecosystems and natural resources means the state needs plenty of expertise in STEM (science, technology, engineering, and math) to help monitor and understand its ecosystems, but cultivating STEM has to start early. One program that enables Maine’s children to pursue education in STEM is the Good Science Scholarship. 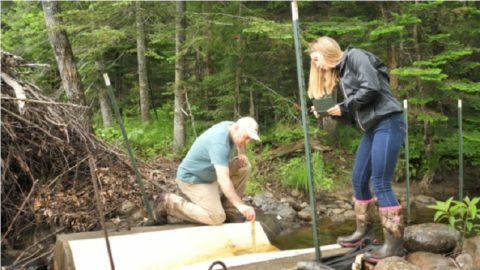 Good Science Scholarship recipient Mary Everett and Poland Spring natural resource supervisor Mark LaPlante take water measurements in the woods of Maine. Like many kids in Poland, 20-year-old Mary Everett always had a strong affinity for the outdoors. “Growing up in Maine, you really have to appreciate nature and the outdoors to like it here. It was so easy to find a hiking trail or a tree to climb,” she says. Around half of all food consumed in the United States goes uneaten. Food waste is among the many challenges addressed at The Ecology School, a cutting-edge, residential, hands-on science education program in Saco that’s funded in part by the Poland Spring® Brand with over $277,000 in public school programs support over the past 10 years. 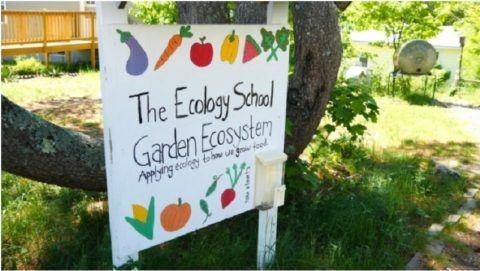 The Ecology School uses its farm to teach Maine kids about topics like decomposition, soil quality, and composting.